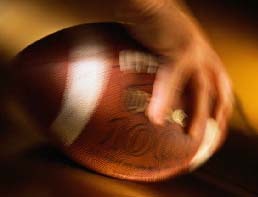 Can playing football cause suicide? Can sensationalism cause hysteria? There are more than 17,000 football players each year in the NCAA’s top two divisions. Anyone know how many have been diagnosed in the past year with chronic traumatic encephalopathy, a disease typically found in NFL players who have had repeated blows to the head? University of Pennsylvania co-captain Own Thomas, a junior and a defensive end. He committed suicide in April. Note to Dr. Wendy Walsh, who’s not a medical doctor at all: That’s Penn, not Penn State. They’re two different schools. That error was benign considering the rest of the post. Start with the headline: Can Playing Football Cause Suicide? It’s clear that that’s what Walsh wants readers to think. “When parents send their athletic boys off to participate in one of America’s favorite pastimes – football practice — the last thing they imagine is that their son’s new hobby could contribute to his future suicide,” Walsh writes on momlogic.com. “But this week, the New York Times reported that a Penn State lineman who killed himself last April suffered from a trauma-induced brain disease that may have caused him to take his own life,” Walsh continued. Um, no The Times didn’t. Walsh also has a journalism degree, apparently from a school where Sensationalism 101 is part of the curriculum. Walsh goes on to claims that “Thomas’ death is making many parents of football players think long and hard about whether or not contact sports are worth the potential price.” It seems odd that “many” parents are thinking this way, yet Walsh didn’t include comments from a single one. Even odder that football is the only contact sport mentioned. Has Walsh ever seen soccer? It also seems that Walsh woke up and discovered CTE just yesterday morning. I’ll admit it wasn’t a huge blip on my radar either until a report in June found that Chris Henry, who had played football at my alma mater, had reached advanced stages of CTE when he died at age 26. Henry was a wide receiver – not typically a high-contact position. He’d never had a concussion during the seven and a half years he’d played at West Virginia University and in the NFL. He did, however, have a history of erratic behavior, including the day he fell out of a moving pickup truck after a fight with his fiance. Henry died the next day. Along with dementia, depression, anger, confusion and aggression often are present in those with CTE. CTE is nothing new – it used to be known “dementia pugilistica” or “punch drunk syndrome” because it was seen primarily in boxers. The NFL long has known it’s a problem. That’s why the 88 Plan was created, to care for former players suffering from dementia. A number of retired players also have agreed to donate their brains when they die, so researchers can learn more about CTE. There’s no doubt that research is needed. Seeing CTE in players as young as Henry and Thomas, who never had concussions, is distressing. The NFL should implement immediately a program through which all players are scanned yearly, as both an effort to flag early signs of CTE and as part of that research. Owners will whine about the cost, though they shouldn’t. It’s not as if they’re holding bake sales to keep their franchises afloat. All leagues need to look at rule changes that could prevent injuries. The NFL and the NCAA now declare plays dead the second a ball carrier loses a helmet. That needs to be extended to all other players. Equipment changes could be in order as well – the NFL’s looked at that issue, too. As far as youth sports, the Centers for Disease Control created a program three years ago that teaches players, coaches and parents the warning signs of concussions. This material should be mandatory reading for anyone involved in any contact sport – not just football. Any and all of those steps will help. What won’t help: Peddling hype and fear instead of research. Contact sports are not going to end tomorrow, so why don’t we focus on protection instead of page views. I’m not against safety. I am, however, against nonproductive hysteria.